Much has been written about the security threats to aid workers and their heroism in the face of adversity; most of it is anecdotal and apocryphal. Fast has produced one of the very few evidence-based, well-researched, and eminently readable studies of the field.This should be on the ‘must read’ list of every researcher, head of operations, and security director working with humanitarian aid in conflict zones.”—Peter Walker, Feinstein International Center, Tufts University”. 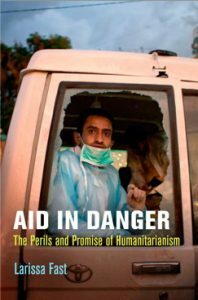 Larissa Fast critiques familiar characterizations of the aid environment and delivers a nuanced analysis of the real dangers within the contemporary humanitarian context. She makes a compelling case that a relational, humanity-based approach to thinking about security will generate behavior and outcomes more consistent with the principles on which humanitarianism rests. This is a book that should be read by students and scholars of aid as well as by practitioners.”—Deborah Avant, Josef Korbel School of International Studies, University of Denver. Humanitarian aid workers increasingly remain present in contexts of violence and are injured, kidnapped, and killed as a result. Since 9/11 and in response to these dangers, aid organizations have fortified themselves to shield their staff and programs from outside threats. In Aid in Danger, Larissa Fast critically examines the causes of violence against aid workers and the consequences of the approaches aid agencies use to protect themselves from attack. Based on more than a decade of research, Aid in Danger explores the assumptions underpinning existing explanations of and responses to violence against aid workers. According to Fast, most explanations of attacks locate the causes externally and maintain an image of aid workers as an exceptional category of civilians. The resulting approaches to security rely on separation and fortification and alienate aid workers from those in need, representing both a symptom and a cause of crisis in the humanitarian system. Missing from most analyses are the internal vulnerabilities, exemplified in the everyday decisions and ordinary human frailties and organizational mistakes that sometimes contribute to the conditions leading to violence. This oversight contributes to the normalization of danger in aid work and undermines the humanitarian ethos. As an alternative, Fast proposes a relational framework that captures both external threats and internal vulnerabilities. By uncovering overlooked causes of violence, Aid in Danger offers a unique perspective on the challenges of providing aid in perilous settings and on the prospects of reforming the system in service of core humanitarian values.